Pretty actress, Uche Iwuji, has described as unture the story flying all over the place that her marriage of barely one year has crashed. Speaking with YES International! magazine on Sunday, November 17, 2013, somewhere in Ikeja, Lagos, the actress who tied the knots with Juwon Lawal, the MD/CEO of an oil trading and logistics company, ABC Fuel, sometime in November 2012, maintained that it's not true. “Haba! Nooooo! My marriage hasn't crashed o!” But her denial not withstanding, sources are still insisting that the marriage which produced a baby boy has since packed up. “Not just that, Uche is also back to hustling; looking for movie roles and all that”. 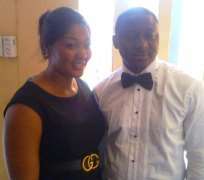 Undone, the sources added that her husband has allegedly relocated abroad, abandoning Uche and their baby. “See, Uche na good girl, but love has been bad and unfair to her. Remember there was a guy she first co-habited with in Spain and at the end of the day nothing came out of it. And before that, she also dated footballer Joseph Yobo who later dumped her for this ex-beauty queen, Adaeze Igwe. Then, Juwon, who she met in London or so. The truth is that I really feel for her!” Investigation conducted by YES International!magazine confirmed that Uche and Juwon were introduced in London by a mutual friend who runs Giselle Home Ltd, a real estate company based in Lekki, Lagos, and they hit it off immediately. They courted for some months before sealing it up with a registry wedding in Lagos. Now, the news filtering out is that things have fallen apart between them. A native of Mbano in Imo state, Uche was born on August 26, 1981 at Randle Hospital, in Surulere, Lagos. A big admirer of Genevieve Nnaji, she's from a family of four (2 boys and 2 girls). And got into Nollywood in 2000 with a role in Zeb Ejiro's Tears in Heaven.